An internet browser preferably Internet Explorer or Firefox. The session will begin with a PowerPoint presentation followed by a hands on lab. 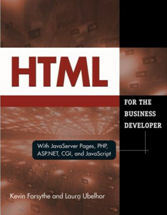 The session content will be based on the book, HTML FOR THE BUSINESS DEVELOPER, authored by Laura A. Ubelhor and Kevin Forsythe. Code examples will be provided. Attendees will have the option to purchase the book at a discounted rate. Purchase of the book will not be a requirement for the session, but will provide an option for attendees to use the material during and after the hands on lab. The PowerPoint presentation and code examples will be shared with attendees. The session is intended for business developers. If you are new to HTML or new to web development the session will provide skills and experience to begin the journey as a web application developer. Whether you are new to web development or have experience the hands on lab will provide an opportunity to learn and advance your HTML skills. Session Registration, PowerPoint presentation and Code examples provided. A registration form must be filled out and provided prior to the event. Registration can be paid on site or prior to the event. Please register as soon as possible so we can prepare for the event and acquire books. We would like to have registration forms by Tuesday, February 9, 2010. Checks can be made out to Southeast Michigan iSeries User Group. You may fill out the registration form and return by email to or or you may fax the registration form to Attn: Laura Ubelhor fax # 248-628-6803. Upon registering you will receive a confirmation email. If you have questions you may call Laura at 248-701-7410. Laura Ubelhor has been providing technical services to clients for over 20 years, specializing in System i development, support, application implementation assistance and web site development. Laura owns and operates Consultech Services, Inc. a Michigan based technical consulting organization established in 1993. She has experience with a variety of business industries, programming languages and has experience on several platforms in addition to the System i. Laura has a BBA and MSM degree from Walsh College. She has been President of the South East Michigan iSeries User Group for a number of years and also has actively volunteered at Common for several years, currently holding the position of Assistant Executive Director of the Common Education Foundation.